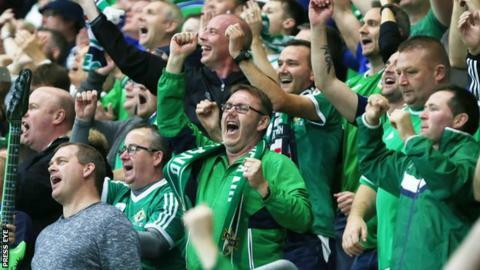 Northern Ireland fans will be allocated around 1,800 tickets for the World Cup play-off second leg against Switzerland on 12 November. The Swiss FA told BBC Sport NI on Thursday that Northern Ireland would receive 5% of the 36,000 capacity at St Jakob Park in Basel. That figure will equate to 1,800 tickets being given to the Irish FA. The Irish FA is working on a priority scheme for the allocation and will give further details in due course. Switzerland's 900-ticket allocation for the first leg at Windsor Park on 9 November sold out within an hour of going on sale on Thursday. Northern Ireland will aim to qualify for their first World Cup finals in 30 years in the play-off against the Swiss.